Cross Fyre Farms is really our small home located in Gilroy, California. It is home to our family of animals which includes dogs, cats, chickens, horses & miniature donkeys. Cross Fyre Farms is not a business, it is just a home for our animals! 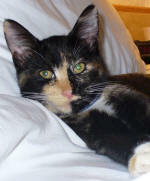 Our newest addition to the family is Shilo, a tortoise Calico cat. She found us in August 2006 while we were vacationing in Oregon.